a.) 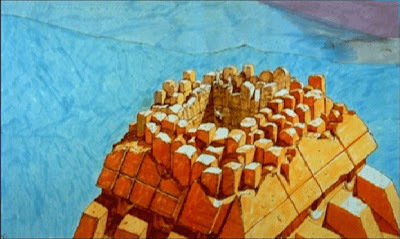 The pyramid is ancient, primitive and clearly of a different design to the derelict. 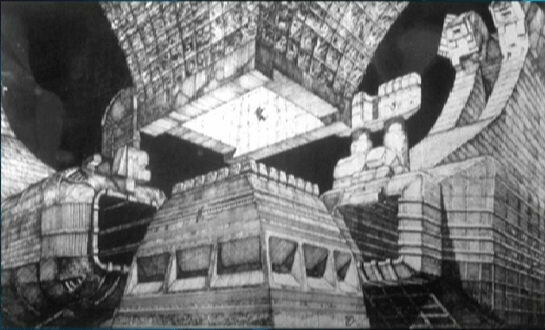 We are dealing with a different alien here: the dead ship appears to be visitors from elsewhere, the pyramid seems indigenous. Walking around it they find no entrance., any entrance must have been buried in the shifting sands of time. So Kane uses his climbing gear to crawl to the top of the monolith. where he finds an open shaft going straight down. b.) Meanwhile back at the Earthship, the computer has finally succeeded in translating the transmission. It means: DO NOT LAND". 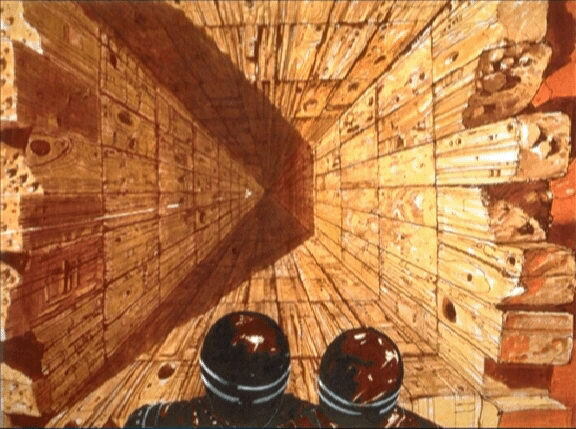 But the explorers are cut off from radio contact and do not learn of this development, so Kane goes down to the shaft. 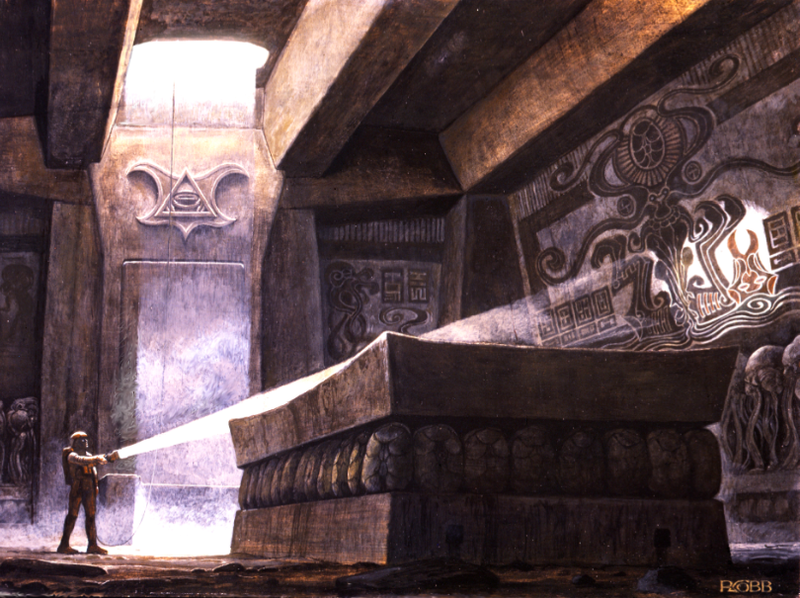 At the bottom he finds a bizarre tomb or shrine filled with incomprehensible paintings and heiroglyphics, which appear to have a religious significance. 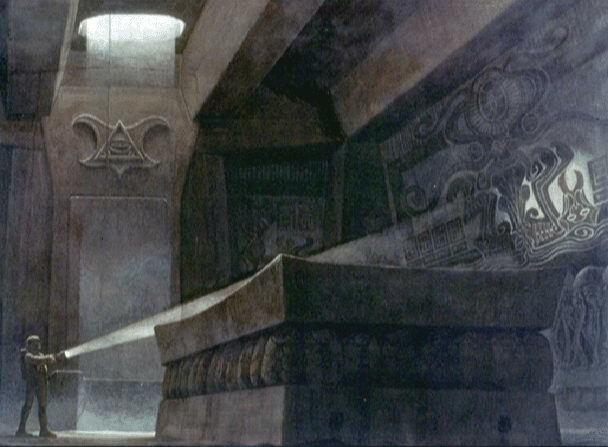 In the centre of the tomb is an altar, surrounded by egg-like objects . d.) Expanding on this in the original conception of the Alien race, the inhabitants of the planetoid are seen as tough and primitive, and with an extremely complicated sexual cycle. Reproduction was very difficult for them and had therefore become central to their religion. And this pyramid was a temple to reproduction (1), the exterior was approximately twenty metres tall and was possibly the creation of an ancient, primitive and cruel culture. Inside the building is a room accessed through a vertical tunnel in the roof since the normal entrance has long since collapsed. The spore pods can be found around the alter in the centre of the room (2). The inhabitants of this world had three entirely different stages in it's life-cycle which are featured as very stylised hieroglyphs on the wall of the birthing temple. 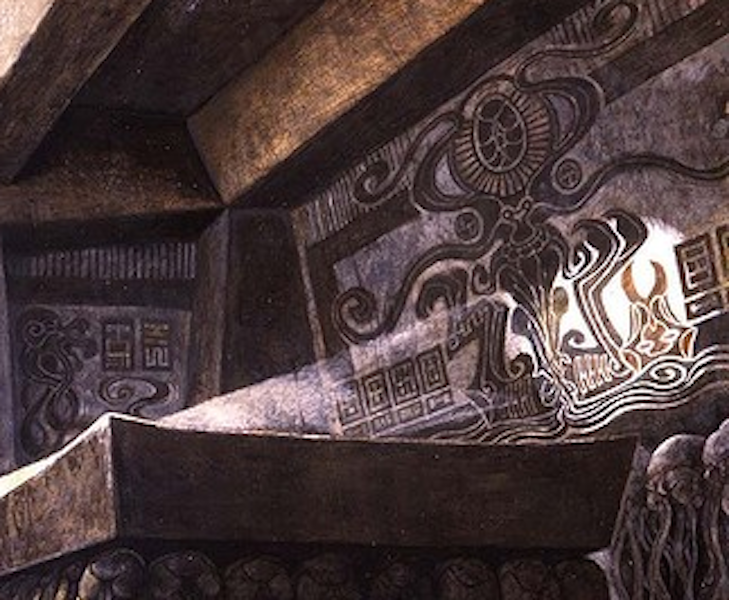 It features an oval design with markings as a spore casing, a star shape as a face-hugger, and the star shapes are shown in conjugation with other life forms perceived as freakish hybrids or Gargoyles, these hybrids were often part anthropoid and part octopus in another rewrite part insect and worm like things are then seen emerging from the hybrids, the image of the spore and face-hugger is followed by a creature with six legs and tentacles as the creature in its young form and then the larger form and the pattern repeats itself. e.) Dan O'Bannon borrowed the idea of a tower on a planetoid through Clifford Simak's Junkyard, in the form of a primitive stone tower on an asteroid that contained instead of birth temple full of spores a creature at the bottom the size of a melon that stole the memories of creatures that touched it and the hypothesis was that the memories would occasionally be collected by an unknown alien race and they discover that this creature had pipes and wires leading into it from the ground that made the explorers wonder if it were a synthesis of animal and machine. (See scriptintroduction in Alien Quadrilogy DVD extras) Why it should have been built in such a primitive way was never discovered by the explorers in Junkyard. 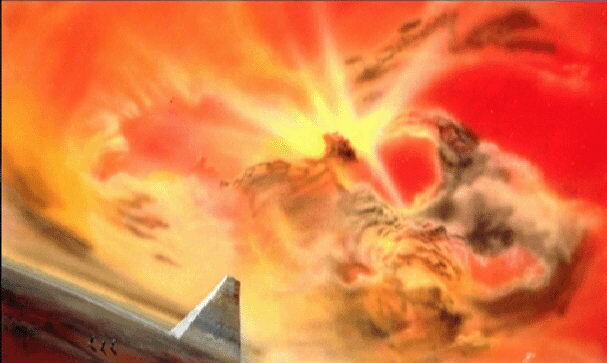 Likewise we never really work out how once thriving culture who built pyramids could have evolved on planetoid 120km wide in Alien. The life form inside the tower serves as inspiration for the spore found inside the pyramid, and just as people lose their memories when touching the life form, those who become victims of the facehugger can not remember anything about encountering the spore of being facehugged. f.) A member of the Earth crew wonders if the pyramid contained fellows of the dead extra terrestrial pilot in a state of suspended animation waiting to be woken up again by their brethren which near enough mirrors an aspect of the ponderings of Erich Von Daniken when he wrote Chariot of the Gods, that he had about the purpose of the great pyramid of Egypt. 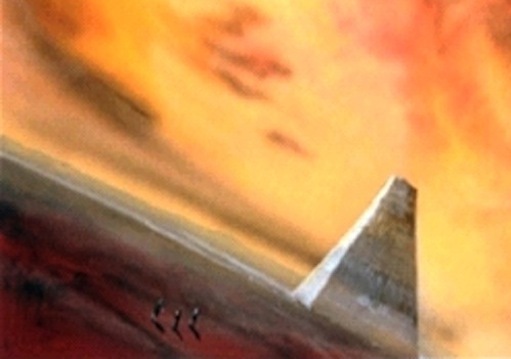 You could also add another pyramid pic here. 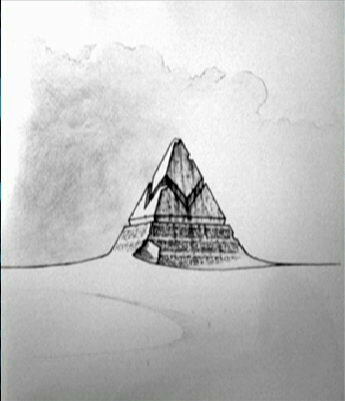 Thanks, well I've added the picture and also a blowup of the part that shows the pyramid. I think a while ago there was a problem with clicking onto the pictures to make them bigger and for that reason I may have decided not to bother with that Foss painting, but now I have added it. It took a while to add it properly because the software here seems to act a bit like a Rubiks cube at times when adding certain things and suddenly other things go out of position.